Despite being a great fan of radio (I admit it - a Radio 4 listener) - I actually have very little time in which to listen. The best times for me are either when gardening or when running, and with the weather this year precious little gardening has been done! The Goodmans GHDAB101 measures 69.5 x 44 x 21.4mm and weighs a mere 68 grams. Power is provided by two AAA batteries, something I fully applaud. While built in batteries allow products to be slimmer that really doesn't help when there's no charge left. A single set of AAA's will give around 10 hours of DAB listening. When first switched on the radio scans for DAB channels available in your area and then allows you to step through each in turn. If you want/need to use FM then the RDS (Radio Data System) is used to identify the channel on the small LCD display. The proliferation of channels in the DAB space can make changing between favourites quite time consuming. In this case Goodmans have added a 'favourite channels' feature allowing you to tag any number of DAB or FM channels and then to tune through a list of only those. This worked very well. During my time with GadgetSpeak I've reviewed a number of DAB radios. With good reception and a good aerial sound quality can be significantly better than traditional analogue. Reception is however a little temperamental. Unlike analogue, where a poor signal can produce a little hiss, a poor signal for DAB usually means complete drop out. How would a pocket DAB radio fare? Surprisingly well! My first serious test was to pop the Goodmans in my pocket and take it for a 90 minute cross-country run. This circuit provides all kinds of terrain including open fields, forested areas and a bridge under the motorway. Plenty of obstructions. There was only one spot - right next to a raised embankment where DAB gave out completely and I had to switch to FM. Other than that for the most part the reception was clearer than FM. Indoor reception of DAB was less successful, Leaving the radio in one place plugged into speakers worked well - but walking around with the radio in my pocket caused continual drop-out. FM in this situation was more successful - but unless you live in a very good signal area this is really an outdoor product. The GHDAB101 does feel a little plasticy - don't expect Apple levels of quality and choice of material. The rear battery cover appears slightly fragile and the manual actually included a separate warning sheet to make sure the clips are correctly located before pushing home. As a reflection of this quality, after my first running session all the symbols on the three rubberised buttons ('M', heart and the triangular 'play' symbol) had completely disappeared (see picture) - a case of the wrong kind of ink maybe! To counter this - I've used this radio fairly extensively for several weeks. It's been stuffed in pockets while gardening and has probably clocked up at least 50 miles on the road. Apart from the initial loss of marking on the buttons, the unit hasn't suffered any other problems. This radio comes complete with a set of in-ear headphones that come with three different ear-piece sizes. The sound quality of these is fairly good - better than the standard Apple offering, although I am a little biased preferring in-ear. In summary - if you're a radio fan and want a decent pocket DAB radio at a reasonable price then this is a great little device. Despite my comments on some of the design decisions, the radio itself and quality of reception are as good as any other radio I've tested. I have a Goodmans ghdab101 dab radio and the back cover has broken, the lugs snap off when opened. where can i get replacements? in the uk ?? Tim, you might like to know you can lock the buttons. Very useful when running! To lock press the top-left button then the big central button. The display will say locked. To unlock again press the top-left button and then the left arrow (rewind or whatever) button. I purchased this dab radio some six months ago. I consider it an excellent DAB radio, but demonstrating the problems with manufacturers having to deal with rationalising, lightness, controls with small size, and built materials/Quality. To this end, the first time I opened the back to add batteries, the plastic catch broke completely. I chose to persevere and not return the item, and get on well with it. 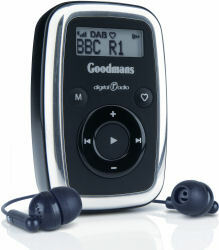 I own a clarity cube DAB and find the Goodman DAB easier to operate, and I fancy the sound quality better. I do find that the central button too easy to accidentally press, as I carry it when running , cycling and walking. In balance, I cannot conceive of a simple answer to getting controls that are usable, convenient and yet be unable to accidentally press.... with all designs. I find that, utilising a store of 3/4 Pairs AAA rechargeable batteries, I get better convenience than the internal USB Recharge internal battery method. I Recommend this DAB. Initially happy with purchase, cant blame manufacturer for patchy DAB coverage  fortunately FM reception was very good. However, after a few days use it defaulted to mute when turning on and the only way to restore sound was to repeatedly off/on (mute control ineffective). Battery case failed to fit correctly due to battery cradle being too shallow. Returned (to Argos) and declined offer of replacement as had no faith in brand. This really is an excellent little radio, and cheap at £45. So much simpler to use than most small FM radios. Out here in Somerset I found reception is excellent. The one snag, of course, is battery consumption. Rechargeable batteries are a must if you listen a couple of hours or more a day.